the little things in our life that are lovely! and maybe even join the lovelyness next week! Here is my “lovely” of the week! Today we made this clever invitation! Her theme this year is Owls and Cake Pos! releasing on the day of Abby’s party! she (we) already had her (our) heart set on a Cake Pop Party.. So we are going to do both… Owls and Cake Pops! Words Can NOT express how excited Abby and I are about her Cake Pops!! Of course ~ later this week We will have to practice making them !! 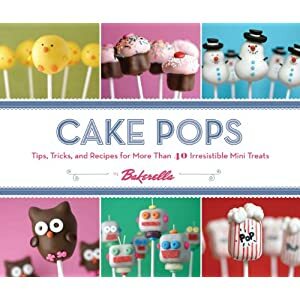 Bakerella just released her Cake Pops Recipe Book … THIS WEEK! see it… the cute owl on the cover?!! Not a ONE on the shelf! the nice guy at Borders said he has 4 more copies arriving on Tues! and Guess where she is going to be FIRST??!! Yep… just a short drive down the Interstate from my home town! or I could go to day 2 in the Seattle area! That book is so adorable. I’m off to check out her blog. Haven’t made the cake pops yet, but I love them. Sounds like a fabulous birthday party! I made her cakeballs and they were very yummy. Hope she has a fantastic birthday party! She is going to have one AMAZING party. Can wait to see and read all about it. Imagine first you got PW’s cookbook signed, now if you could just get your Cake Pops book signed…you will be one lucky lady. That sounds like such a super cute party! Have fun! Those look melt.in.you.mouth.yummy- I’m wanting some. Have a great time making them and a Happy Birthday party too! 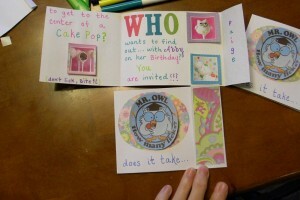 hos cute is that…the invitation and the cake pops! sounds like a great birthday you have planned for your daughter! bty…owls are my favorite birds! there is something very mysterious about them! i love bakerella–never made a recipe i didn’t LOVE! What a cool idea, Owls and Cake Pops. Good luck on the baking I’d love to see your creations. what an adorable birthday party idea!!! and I just think I might NEED that cake-pop book! so fun!! oh, those are cute and i just love the owl theme, very cool. my 10-year old niece loves all things owl, too! those cake pops are going to be adorable! Thanks for your note regarding my brother. And for all of your sweet comments… they are always a pleasure to read. Those are really cute! I wish Em loved reading as much as Abby does! I’m kinda leaning toward getting that cookbook too! i love owls and i love cake pops so that party sounds like heaven to me! so glad you linked up. and thank you so much for the kind words! you’re the best! i hope we get photos of the party and the cake pops. i tried making them and they tasted fine but mine weren’t very cute, oh well i need to try again. good luck with yours! That is just the cutest thing ever! Those cake pops are awesome. I just spent some time going through your blog and love it! You have a beautiful family! That looks darling… absolutely adorable. The cake pops, I would have a hard time eating them because they are so stinkin adorable. Can’t wait to see everything! My littlest guy has a birthday coming up – I’m just starting to think. We used to have a Halloween Party early – and everybody dressed up. I’m definitely going to look into those cake pops! what an awesome party idea and so unique- I think it’s perfect. and so stellar to see a kiddo so into reading, it makes my English teaching heart happy! thanks for stopping by my neck of the woods- maybe we can motivate each other to finish some projects? as for the headboard I think fabric stretched on canvas would be awesome and so much easier than what i did, if all else fails you’ll have some spare canvas to suit your fancy!